A s a critic, I am used to going to first nights — you could say it’s my workplace. They may be glamorous occasions for some, but I’m there to do a job of work — though I also hope to derive pleasure from it, too. (In fact, that’s my hope every time: that I’m going to have a great evening). But it’s not for that reason alone that I like last nights much, much more. As a serial repeater of shows I love, there’s nothing quite like going to the last night. Of course, there’s inevitably something a bit bittersweet about them, too: that a show you love is not going to be there anymore. And the cast, who’ve bonded over the previous several months of rehearsals and then a run, won’t be seeing each other again after the weekend, either. So there are inevitably tears. But there’s also joy: removed of the tension of the first night (and the impending reception it will receive from us dastardly critics! ), the audience and cast alike can just enjoy themselves one last time. 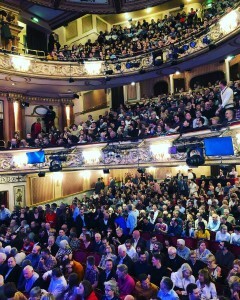 They’re also uniquely democratic as well as celebratory; anyone can buy a seat to be there, rather than requiring privileged access, as invitation-only first nights do. (On a cult show, it may require a bit of advance planning: I’ve already bought my tickets for the last night of Les Miserables at the Queen’s, when the original production will be retired, on July 13; and also for the last night of the National’s Follies on May 11, which is its second last night I will have gone to, having also seen the last performance of the original run last year). 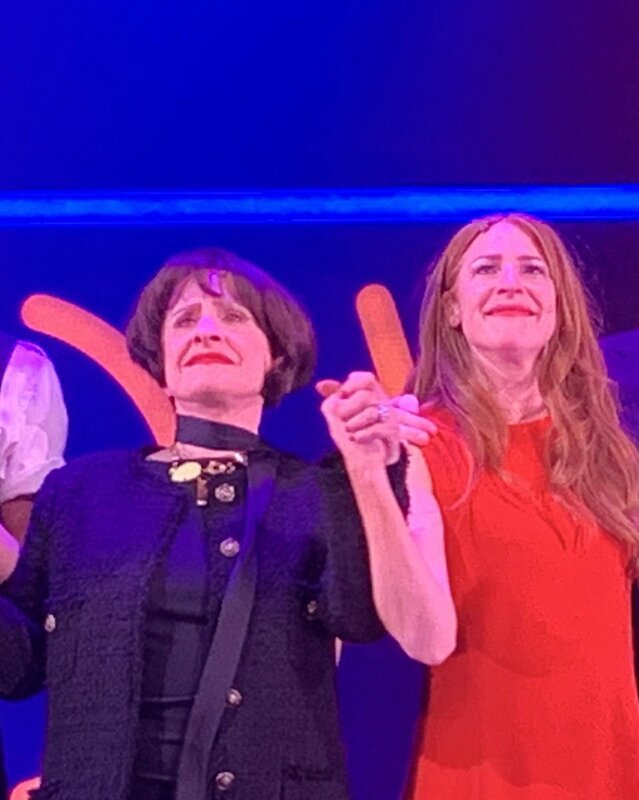 On Saturday I went to the last night of Company at the Gielgud [stars Patti LuPone and Rosalie Craig are pictured above], and it was simply thrilling from start to finish. 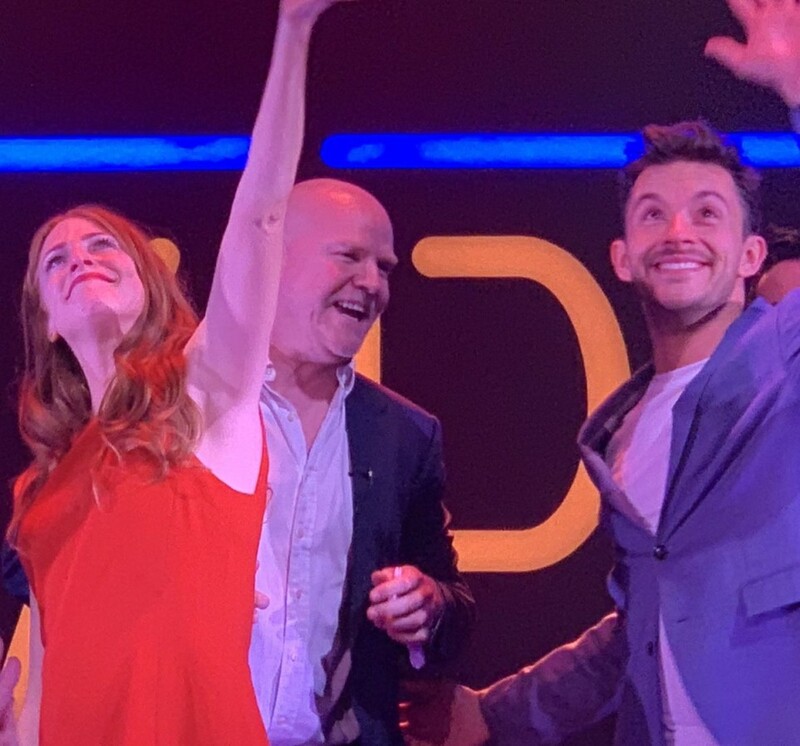 It’s difficult to describe, but there was a tangible electricity in the air — fed by the audience, but also amongst a set of phenomenal actors who clearly love the show and their characters. The stakes were also quite high as star Rosalie Craig, who plays Bobbi, had been off for most the week. As she tweeted earlier in the week, “I’m absolutely devastated to miss 1 second of this last week of Company. I have laryngitis and am doing everything I can to get back.” On Saturday, she was back — and there was absolutely no sign of a compromised voice, either. Even as the lights went down, a massive roar came from the entire theatre — and then when Craig makes her first appearance alone on that stage, we roared and cheered again — so much so that she smiled knowingly to acknowledge it. It was only the first of many literally showstopping moments — and for the first time in my own experience, there were four separate mid-show standing ovations across the course of the evening, ahead of the inevitable final curtain call one, including Jonathan Bailey getting one for ‘I’m Not Getting Married Today’ and Patti LuPone (of course) getting another for ‘The Ladies who Lunch’. 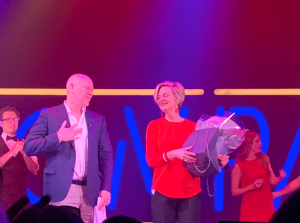 But ultimately this was a triumph for everyone — and in some generous curtain call speeches from producer Chris Harper and director Marianne Elliott [pictured right], the backstage crew were also brought out onto the stage to be applauded for their contribution. 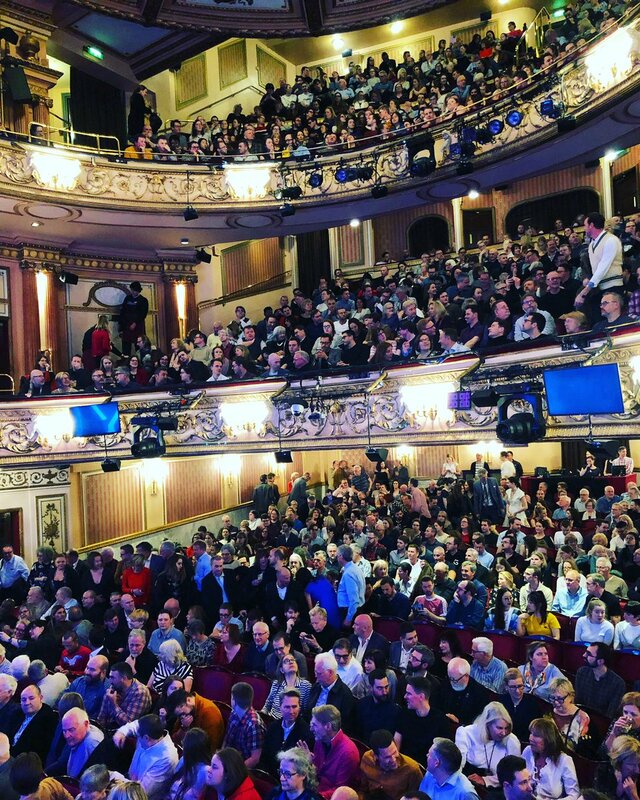 As so often at a Sondheim event, it also felt like we were applauding ourselves, too — for being part of an exclusive (but happily widening) club. Now roll on the last night of Follies!